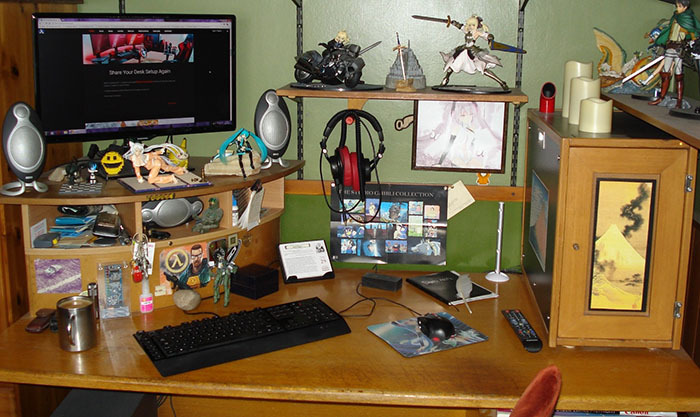 Back in January 2011, I created a post called Share Your Desk Setup, showing my desk and setup and asking for readers to send in theirs. I recently received a email asking me to do it again, so here it is. 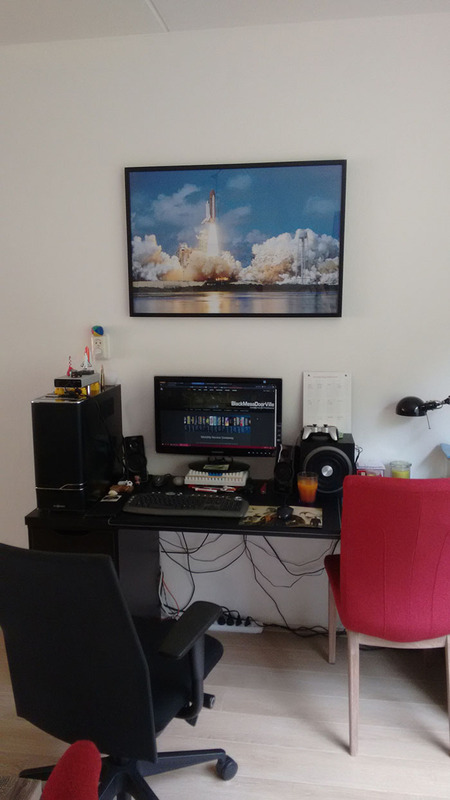 You send me an image of your desk setup, any notes and your name (if you want it included) and I’ll post it. At the end on September, I’ll randomly select a photograph and give a $5 game (via Steam) to the person. There must be a minimum of 20 photos sent in though and RunThinkShootLive.com must be visible on the screen. Please don’t post images in the comments as they won’t appear, same for links. Send them directly to me: runthinkshootlive@gmail.com and I will add them to the post. By the way, this is part of a series of posts called Reader to Reader, where readers share things about their gaming with other readers. 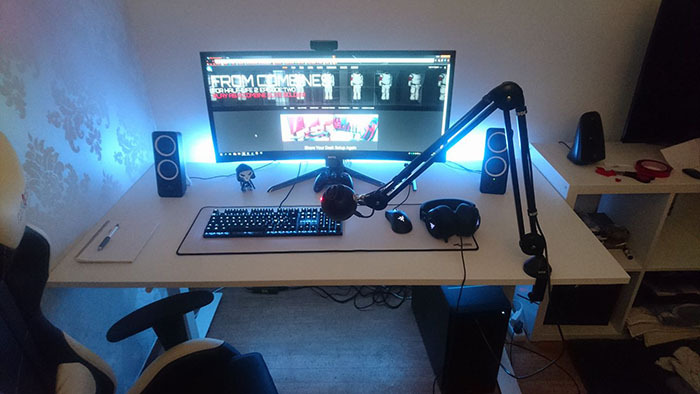 The featured images comes from a video entitled The BEST Gaming Setup of 2016! from the RandomFrankP YouTube channel. 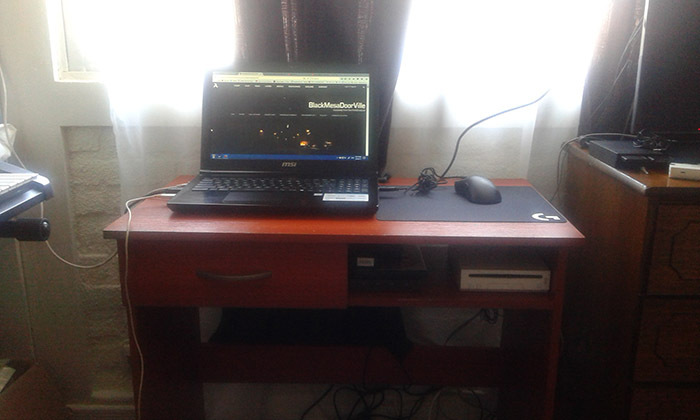 If you have viewed the original post, you will see I have the same desk. 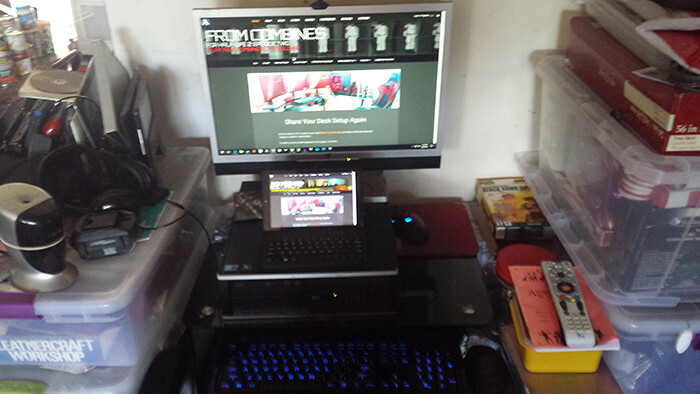 But now I have a desktop PC instead of the laptop. 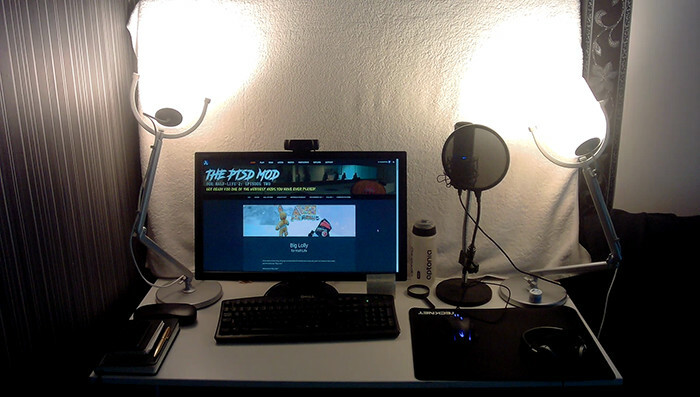 The background and lamps are for my streaming. 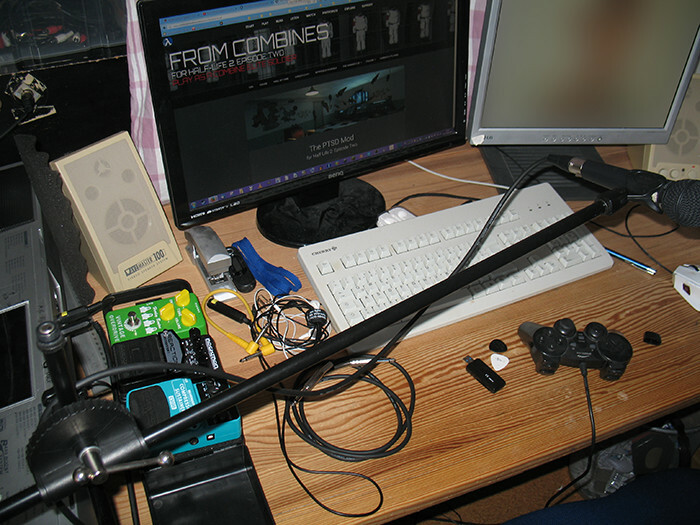 This what happens when you turn your desk into a homestudio (I blurred the second screen because I figured most people might not appreciate a hot guy as much as I do). The mixer and the keyboard are outside the picture, I’m afraid. 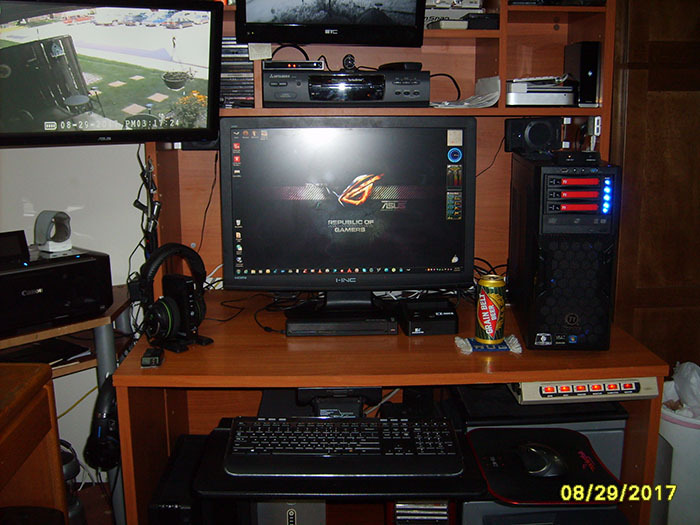 Also, this is pretty tidy (for my standards), because I actually cleaned it up for the picture. Thanks, Phillip, tidying it up was long overdue anyway. 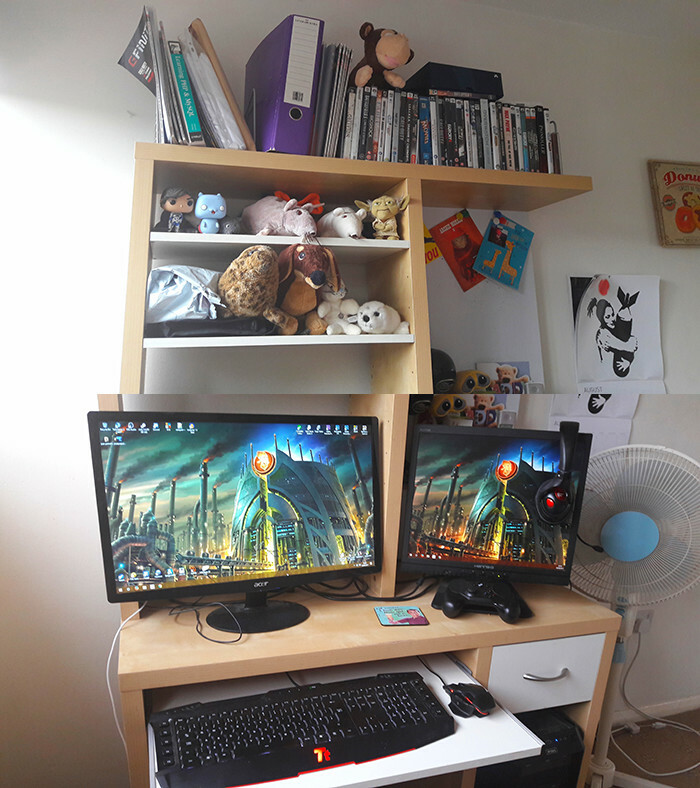 I can’t actually fit my entire desk into one shot. Here’s how it looks for now. Bottom half is strictly business, upper half is pleasure. 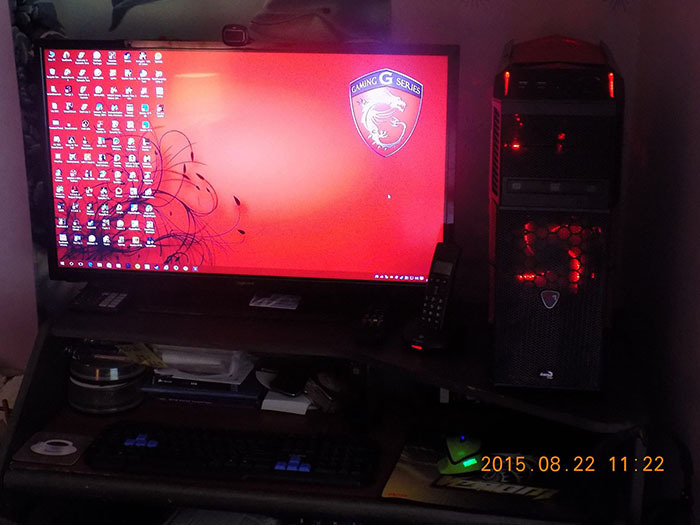 core i5 3330,8gb ram,120gb ssd and 1tb HDD … msi R9 270x (4GB ) ,seasonic 520w psu and a aerocool devil red case …..
My Desktop setup as of 2017. My old 20-inch multiscan VDU went the way of the local council waste reclamation yard. it was a dear old friend and had done sterling service for a number of PC’s! I admit my first sight of a widescreen Phillip was indeed a surprise! My Vento A8-cased PC is hiding behind Hokusai’s famous Fuji-san in a custom box. Light means case fan is on, used to be two but old PC fans die eventually! The red auxiliary funnel is one of two vents. 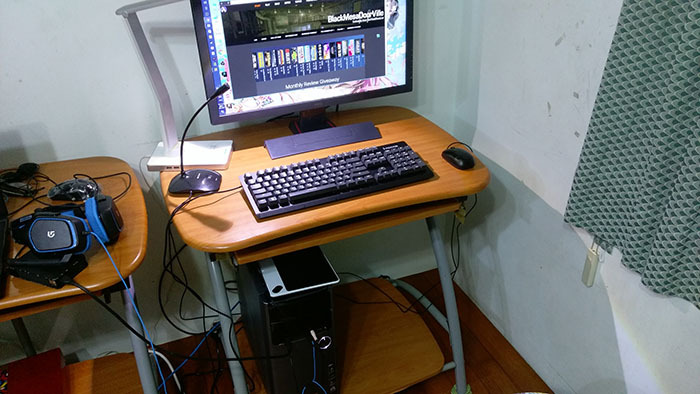 The Dolby 5.1 is an old Dell setup with a PC-sized thumper under the desk! Tea is hot, rock is not a pet and King Arthur is a girl! 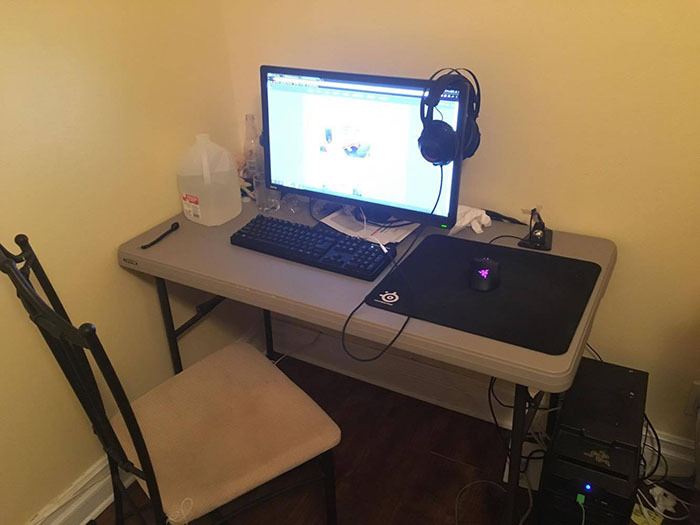 Table: Ikea Skarsta, Chair: DX Racer, Monitor: BenQ XR3501, Keyboard: Roccat Suora FX RGB, Mouse: Razer Deathadder Chroma, Mousepad: Glorious PC Gaming Race Mauspad, Headset: Razer Kraken 7.1 V2, USB XBOX360 Controller, Microphone: Blue Snowball Ice, Microphone Stand: Rode PSA1, Speaker: Very old, very cheap, don’t remember the name, Webcam: Logitech C920, Old School Pen and Paper, Overwatch Reaper POP figure. I am kinda obsessed in keeping my desk Clean, but the rest of my apartment looks like garbage. 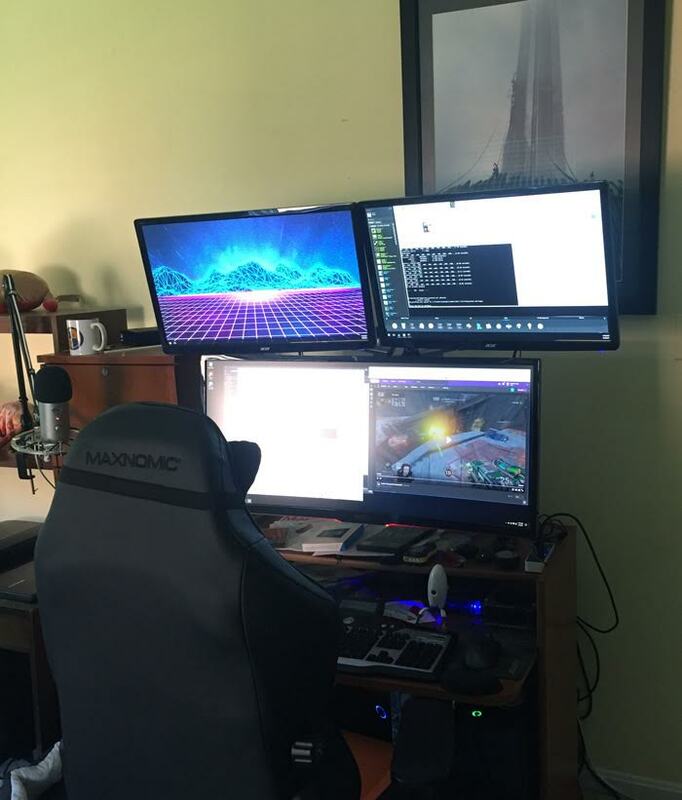 “If three screens seem like a lot, then how about four? Actually the 3 Iiyama’s make up one big UltraWide ‘Eyefinity’ screen. Once you’ve played UW, playing on 1 screen feels like looking through a tube. UW playing really pulls you into the game. If you have the room for it it’s actually not crazyly expensive. 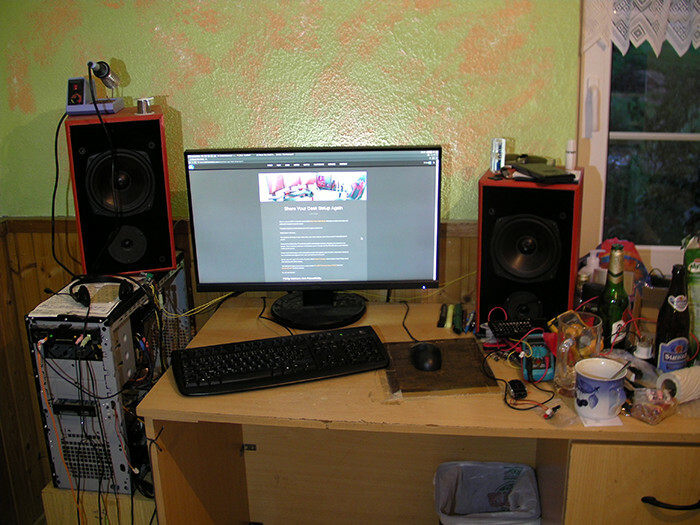 The 3d Iiyama I bought secondhand, I’m still running an i7 from 2010 and I ran the 3 screens on a midrange card for 7 years (Radeon HD5850) with all HL2 settings on high and 5760*1200 resolution at over 100 fps. I upgraded recently to an RX480 (today’s midrange) only because of games like Rise of the Tomb Raider and Doom. I found out this card actually supports more than 3 screens so I got a write-off from work as a 4th screen so I can watch Phillip’s playthroughs and play alongside. HL2 supports UW perfectly with one exception: informational on-screen text as used in ‘An extra step’ in ‘BlackMesaDoorVille’ and recently ‘From Combines’ will not show which sometimes leaves me clueless about progressing in the mod. So one request, avoid this! Subtitles do work (as you can see in the picture) so if unavoidable, perhaps use that as an alternative.